At least eight people have been killed in an explosion at a chemical plant in Egypt, local security forces say. Reuters news agency quoted them as saying that a further five people were injured as a tank exploded at a military-owned phosphates factory in the port of Ain Sokhna. Civil defence forces cordoned off the area around the factory and the injured were taken to local hospitals. State news agency Mena said the tank had exploded during testing. It reported that 15 people were killed or injured. 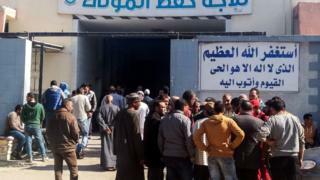 Two medics told the AFP news agency that 10 bodies had been received at a morgue in Suez and families of victims had gathered outside. Ain Sokhna is about 130km (80 miles) south-east of the capital Cairo. Popular with tourists, the Red Sea coastal town is also home to several petrochemical, ceramics and steel factories. Twelve people were injured in an explosion at a chemical factory near Cairo's airport in July. The latest blast came after six people were killed in an explosion at a chemical plant in China on Thursday.